InMotion Hosting VPS Virtual Private Servers are very robust, powerful, and include InMotion's Max Speed Zone technology. Aside from the highlight above, check out what all three packages include as of April 1st, 2010. VPS Hosting solutions by InMotion Hosting are a great alternative when compared to low-end dedicated servers and perfect for those who need more than a shared hosting account can offer. VPS Hosting by InMotion Hosting allows for an affordable solution for small businesses that need special features such as SSH access, custom firewalls, dedicated IP addresses or other features usually reserved for dedicated servers. All of InMotion Hosting's VPS accounts also include a full license to the award winning control panel CPanel for FREE! 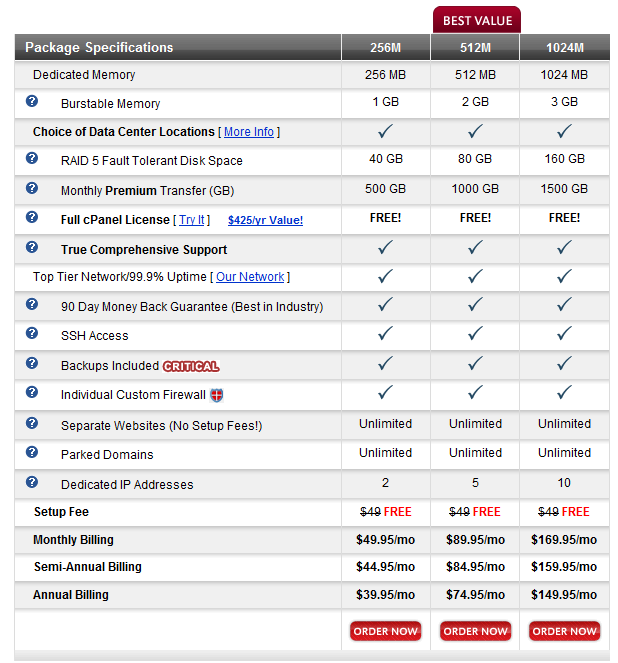 Of course, over time, the above picture will probably go out of date with their current packages so be sure to visit InMotion Hosting to see what their latest package structure offers. Now if you are new to hosting and just starting out, we highly recommend going with InMotion Hosting's business hosting. A VPS would probably be overkill for a new website and there's no sense in paying more for something you aren't taking full advantage of. But if you have a popular web forum, blog, or other site that uses heavier resources, your visitors would benefit from faster loading pages, less wait times, and a better overall experience. If you are interested in owning your very own virtual private server through InMotion Hosting, be sure to visit them now to see their latest packages. Have an InMotion Hosting VPS review you would like to share? Please submit it to our InMotion Hosting VPS Review site. Make sure you select "cPanel VPS" in the Hosting Type field.